Prête-Moi Paris celebrates 4 years in style! Whether they're about food, art, daily life or travel, there are a bazillion new expat blogs launched in Paris every year. There seems to be something about living in the French capital that inspires many of us to share our interests online. What's much more rare is when a blogger is so committed to writing about fashion, bubbly, gourmandise and DIY that they're able to celebrate their four year blogiversary. That's exactly what Melissa, whom I will forever think of as the 'hostess with the mostess', did last Tuesday evening. 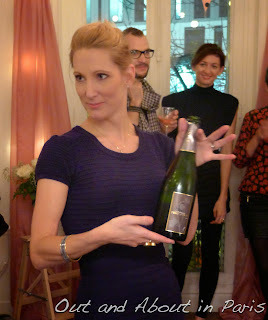 The fun started when I received the official invitation for the Prête-Moi Paris four year party via email. Liberally sprinkled with red hearts and pink sentences, Melissa tempted us with bubbly from Mon champagne, cupcakes from Sugar Daze, a fashion show featuring Vintage Galerie, Cleopatra's Bling and Kasia Dietz Bags and a drawing every hour. After a quick glance at my calendar, I RSVP'ed with an enthusiastic "Yes!" Vintage Galerie: Elisabeth and Camille have an on-line boutique for their collection of vintage fashion and accessories from the 1920's to the 1980's. Unique, luxurious, timeless and of course trendy, these ladies hunt down exceptional pieces for their clients. You can find them at various vintage salons, or you can welcome them into your home for a private showroom of a selection carefully conceptualized just for you. Mon Champagne: Mon Champagne has taken a product that everyone loves, champagne, and given it a personality. Their by-line : Adopt a champagne! Awwww! You can test a selection of 3 (or more), until you find the one that you like best, and then stock your "cave" with it. Why? Because these champagnes are not as pricey as the big brands. How? Mon Champagne selects quality champagne producers from lesser know areas of the Champagne region, tests, tastes, showcases their best "champagnes créateurs" and passes the savings on to you. And now, Parisians, you can have it delivered to your door. Or... Sunday's at 11am you can also taste and buy these bubbly bottles at the Marché Saint Eustache 75001. Kasia Dietz Bags: New Yorker transplanted to Paris with an Italian amore. Kasia once worked in the crazy New York marketing world, and exchanged it all for a life of travel and design in Paris. Now she creates tote bags for the urban, hip woman who has an appreciation for nature, art and design. Her fabrics are carefully selected from a secret place in Paris, for each collection, and her painted city pieces are lovingly made one at a time by hand. Her work has been featured in magazines and online publications all over the world. What's best about her bags? They are reversible! Each bag has two personalities! Cleopatra's Bling: Olivia is the sunny Australian, bubbly, contagiously happy, down-to-earth creator of Cleopatra's Bling, her ethnic inspired jewelry line. Her pieces are bold and beautiful, full of rich colors, textures and fabulous semi-precious stones that are big and luscious. Her pieces are made in either Istanbul or India, and can work both in a trendy boho chic look, or a Parisian cocktail ensemble. Sugar Daze Cupcakes: The authentic American cupcake in Paris. 'Nuff said. Okay, but there is a lot more to say about Sugar Daze : Cat, the creator, makes hands down the best cupcakes you'll find on this side of the Atlantic. She also has a thing for 1990's rock bands and her cupcakes are inspired by them. Her shop is in the trendy 9th district on the hip rue Henri Monnier. She shares the knowledge by offering cake and cupcake classes in her boutique. And well, she is creative, inventive and just totally sweet, but not to sticky! From one American expat blogger in Paris to another, I wish Melissa of Prête-Moi Paris lots of success with her blog and other endeavors. Here's to four more years! Ella Coquine: pretty in pink with prête-moi paris. Wow, sugar overload. And I love it. Merci MK! This is a wonderful piece on the event! So glad you came. And I appreciate your lovely post. Was so sorry to miss this - does look like a fabulous time was had by all! What a fun evening!! I'm loving all of these recaps! : ) Oh and thanks for the link-up, MK! Isn't it great that you meet all these people through blogging? When you arrived in Paris without a friend, what a good idea it was to blog and write on TA. Mind you, you are such a lovely person you would have made friends anyway.
. Not just sugar overload but those sandwiches or buns, whatever, they are look good too!